We talk a lot about gear, and a lot about female travel safety, but we haven’t really covered the nitty gritty of advice for the first time solo female traveler… yet. There’s a lot of questions that can go through your head before heading off on your own. 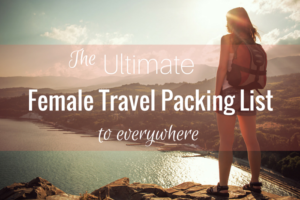 I’ve created this list of tips from personal travel experience and from the experience of my female travel friends to help you be more prepared, and more confident, before your first solo adventure. I love a good open-plan trip, but when I travel alone, the one thing I am sure to plan out as best possible is my arrival. Everything from getting off the plane to getting to the hostel or hotel is researched in as much detail as is available to me so I’m not just thrown into the wild (as it can sometimes feel in certain destinations). What’s the best way to get from the airport to the hostel? Which taxi company is safest/ most reliable? What is the average cost for transport from the airport? Where do I go when I arrive at the airport? What’s the procedure for arrival, visas, and immigration? Are there ATMs readily available on arrival, or money changers? What scams should I be aware of that take place in or near the airport (or train or bus station)? There’s nothing worse than arriving in a destination where you don’t speak the language and being bombarded with countless guys spruiking random taxis in different directions, and you just feeling massively overwhelmed. Even if you have to write them down and point, at least trying to communicate in the local language can mean the world to the person on the receiving end. It’s also helpful to let people know that you don’t speak their language, or to ask if they speak English. The more you know, the less chance you have of getting ripped off with pricing, and to just get from A to B in a more efficient manner. There are plenty of language tools for travelers these days. Don’t keep all your bank or credit cards, and especially cash, in the one place. It’s helpful to hide a backup credit card and some extra cash in the bottom of your backpack or other secret stash, just in case. Before you travel, it’s wise to let your bank and credit card providers know you’ll be traveling, for how long, and in which regions of the world. This is so they won’t suspect your card of being fraudulently used and then put a block on said card being used (when you probably need it the most). Yep, I’ve been there. Trying to Skype your card provider from your Mexican hostel over sketchy wi-fi is not a situation you want to be in. >> We talk a bit about this tip in our Pre-Trip Countdown post. You are your own best security alarm. In other words, if something seems off, trust your instincts and swing in the opposite direction. If something would seem like a dumb idea at home, then don’t do it while traveling. And most importantly, alcohol only within reason. People don’t have to know that you’re traveling solo, as long as you don’t let them. You can always be meeting a friend or waiting for your boyfriend or husband. If you’re ever being approached by a guy in a public place, like an event or a bar, say you’re waiting for friends. If the guy is persistent, find a group of friendly faces and insert yourself into the conversation until you feel comfortable. Hopefully that never happens, of course! People don’t have to know that you’re traveling solo, as long as you don’t let them. A rough itinerary and contact details for accommodation should be left with family and/or friends back home. It’s not just a good idea so family can reach you if they need, but also so you can reach authorities if ever caught in a bind. Make sure you have an unlocked cell phone before leaving home. Once you arrive, SIM cards are often quite cheap and credit can include both mobile and data. And don’t be shy when you’re there. Hostels are excellent places to meet other travelers and possibly find solo travelers to partake in sightseeing with. Many hostels will also put on social activities, like barbecues and city tours. Always. Never leave any bag behind, even when getting up at a cafe to grab your coffee. The nightmare stories of people going 3 months without any issue to let up their guard at the end of the road and have their camera (and all their memories) stolen are numerous. Don’t be one of them. Do you want to be in control of you and your belongings when you travel? Packing lightly means you can focus more on what’s happening around you, instead of how much your back hurts while trudging up some stairs. Don’t be the girl that has the giant backpack on her back, the big and heavy daypack on the front, all while trying to navigate through the sardine-packed Kiev metro system (and not being able to speak or read ANY Russian/Ukrainian!). Trust me, it’s not fun, and it’s not safe. >> Learn to pack smaller, lighter and smarter. And enjoy the journey! You’re about to embark on a life-changing adventure. Not only will you grow culturally and spiritually, but you will gain an insane amount of confidence in the process. I was scared to death before my first solo trip, but I wouldn’t be who I am, or have what I do, today without taking that leap. Life. Changing. Brooke, thanks so much for for this post. I’m travelling overseas for 10 days solo for the first time. I’ve travelled a lot, but always with others, or meeting others in the location. This is a big step for me because of past trauma. It’s time to reclaim my life. I hope you have an amazing time, Jazzy! Great tips! It is so incredibly easy to meet other solo travelers on the road that being solo is never a reason to not get out there and travel. Definitely #10. Although I was fortunate enough to not have anything stolen, I definitely began to feel a little too comfortable towards the end of my 2 month trip, and had to give myself a good talking to. #1 is also one of the most important things I made sure to do, This list is great! I laugh at #11, because I’ve been there! I’ve been on three missions trips to Ukraine and have definitely had to haul luggage through Kiev transportation. I was that girl wearing two backpacks while dragging a big suitcase and hockey bag. But, in all fairness, all of us were loaded down with hockey bags full of donations. If I was just going on vacation I certainly would not have so much with me. Another thing to keep in mind – if someone is meeting you at the airport, or you have reservations somewhere, have a way to communicate with them from anywhere. On my last trip I was travelling alone. Flying from Toronto to Kiev, with a short layover in Moscow. Ed was meeting me at the airport in Kiev. Our flight from Toronto was so late that our connecting flight left before we landed in Moscow. 26 of us were stranded. Of those 26 people, only 2 of them were willing/able to translate for me. Nina was wonderful, once I told her that I barely understood Russian she became my temporary Mom. The airline provided food and a place to stay for the night, and let us use their company phones to call whomever we wished. At that time I realized that I should have gotten Ed’s phone number. We had arranged everything by email. I had no idea how to get his number either, short of calling his mother back in Canada in the middle of the night. I had my laptop with me, but never found any free wifi at the airport, and the paid access wifi wouldn’t accept my credit card. I figured once they took us to a hotel I would be able to get on the internet, but that was not to happen. We were taken to a convent (yup, nuns and all) that rents rooms. Beautiful place, but no internet. So I just followed #5 and kept my wits. I was safe, not lost, decently fed, and someone was waiting for me. The next day we made it to Kiev. I was fairly relaxed as I went through baggage claim and customs, but when I walked through the doors into the mass of people I nearly lost my cool. Ed was not there. I walked through the mob and just pondered what to do next. Then Lera (one of my previous translators) walked up behind me. Ed had been there to meet me the previous day, but I wasn’t there. So he called the airline to find out what was going on and they told him where I was. It all worked out well in the end, makes for a fun story, I learned some valuable lessons, and discovered another level of independence. Have multiple methods of communication. Be flexible and enjoy the moment! Hi Melody! So you know my pain involving Kiev transport! Haha I was very naive on my first visit there. And I also have similar experience involving not having multiple methods of communication! oh boy! Now I NEVER rely on there being an internet connection because every time I’ve needed it in the past, it was never working. All times when I was in a weird place and supposed to be meeting someone. Yes, I feel your pain!! I have traveled that country by plane, train, bus, marshrutka, taxi, private car, and by foot. Third class overnight train is simply awesome, especially when the young kids below you yell and cry all night. On the first two trips there were other people in charge and they took care of all the logistics. I was all on my own for the third trip and I never considered the possibility of not arriving in Kiev when I was supposed too. Things could have been much worse, and in the end it was a good experience. That was in 2008. Nowadays there is much more wifi to be found, and lots of it is free. Walking around with a smartphone looking for a signal is a lot easier than wandering around with a laptop. I still would ensure that I have a phone number, email, and address. And I will be smarter about packing my carry-on. No girl wants to be without shampoo. My experience there was in 2008 as well! My first visit was just stressful because I didn’t know any Russian/Ukrainian and I had that issue with the big backpack on the public transport! The 2nd visit was still stressful, even after learning a bit of Russian. I remember I really needed the contact info for the language school that was having someone pick me up, because the dude wasn’t there at the airport, and I had no idea how to get in touch without the wifi working, or without a local SIM card. It was also late at the airport, no help desk person. I really wished I had written down some real info! Ugh nightmare. 🙂 I ended up living there for 5 months before I decided to move to Australia to be with my boyfriend (and that’s where I’ve been since!). Awesome tips , its my first trip solo im very excited and all your advices for sure are going to help me on my new adventure that i’m about to experience. thanks Brook. What a great post as always! !